ORLANDO, Fla. (May 31, 2017) – A brand-new show has opened at SeaWorld Orlando and it will blow park guests away. 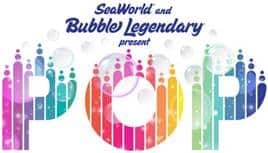 In a first of its kind collaboration SeaWorld and Bubble Legendary present Pop, a live performance that takes inspiration from bubbles found in the sea and brings them to life in an amazing artistic display that is distinctly SeaWorld. The world-renowned bubble legend, Fan Yang brings his unique talent to the stage for each live performance. Beautifully choreographed to a custom musical score, each show takes a child’s imagination and explores new ways to create, celebrate and manipulate bubbles of all shapes and sizes. The result is a larger than life performance that delights guests all ages. During each performance, Fan Yang’s fascinating bubble artistry is enhanced with state-of-the-art lighting, sound and lasers. The set features 23-foot tall screens which flank the stage. Each show also surprises two members of the audience, as they are “bubblized” into the heart of a life-size bubble on stage. The show culminates with a wave of light, lasers and sound while surrounding the entire theater in a seemingly endless sea of bubbles. Pop performs two to four times a day at SeaWorld’s Nautilus Theater through September 4, 2017. The show does not perform on Thursdays. Like all shows at SeaWorld Orlando, Pop is included with park admission and reserved seating options can be purchased online or at the park. Pop marks the official kick-off of an exciting summer at SeaWorld. What’s next is now as the park continues to unveil a full line-up of new attractions and excitement. Later this month, Kraken Unleashed: Virtual Reality Experience, a new one-of-a-kind virtual adventure on SeaWorld’s Kraken roller coaster will open. The all-new Electric Ocean nighttime spectacular will also debut, transforming the park after dark into an exotic underwater world that lights up the night, complete with a fireworks finale. The best way to experience all that SeaWorld has to offer this summer is with a multi-park ticket. Guests can buy early and save big by purchasing admission in advance online. Two-park tickets are only $54.99 per park to either SeaWorld Orlando or Aquatica, SeaWorld’s waterpark. For more information, park hours and to purchase tickets, visit www.SeaWorldOrlando.com. Follow SeaWorld on Facebook, Twitter and Instagram for the latest park details and information.